The explosive CBC documentary has been in the works for over a year, since a JPM whistle-blower on March 15th, 2012 alleged that JPMorgan was manipulating the price of gold and silver in a note posted on the CFTC’s website, and taken viral after it was posted by SD. The whistle-blower was placed in contact with Andrew Maguire shortly after, who upon reviewing the information and documents the JPM employee had obtained documenting the alleged manipulation of gold and silver, assisted in making an official filing to the CFTC. At the time, Maguire believed the evidence of malicious price manipulation in the gold & silver market was so compelling that the CFTC would be forced to act on the information. To no surprise however, the CFTC reportedly sat on the information, making no public announcements or actions over the past 9 months, while the whistle-blower left JPM & fled to China for safety. As a result, the whistle-blower has been left no other recourse than to pursue public exposure, resulting in the CBC’s The Secret World of Gold documentary. The story was partially leaked through the PM blogosphere last August, with both GATA’s Bill Murphy and TFMetalsReport’s Turd Ferguson predicting an explosive and historic move in silver last August out of expectations that the information would be released and acted upon by the CFTC, as in the words of Andrew Maguire, the documentation provided by the JPM whistle-blower was damning evidence, & everything we could want to prove gold & silver are in fact manipulated. August, September, & October came & went however without any action by the CFTC. In response, the (now former employee) JPMorgan whistle-blower who submitted the information to the CFTC alleged in October of 2012: The CFTC is sitting on information that implicates JPMorgan as manipulating the futures market in Silver and Gold. The reason this is so damning is that the CFTC has evidence that incriminates JPM as having malicious short positions designed to influence the price action of Silver and Gold towards JPM’s favor; akin to the LIBOR scandal in which rates were manipulated down towards the banks favor. “Word on the street is that Tony Blair, who is on a retainer to JPMorgan for $2 million a year, made a call (and the story was dropped). Did that happen? I don’t know. It’s an opinion that people hold; it doesn’t make it so. But something made the BBC stop an important investigation into which they had probably invested three-quarters of a million dollars.” McKenna’s film also explores the secretive smuggling of European gold reserves during the Second World War, and how gold has gone from a reliable physical currency to an abstract concept, bought and sold in the blink of an eye on the stock market, taking on all the baggage of modern global finance in the process. An investigative journalist and historian, McKenna estimates he has made 100 films over his career, including many provocative documentaries on war and politics. The topic of gold presented itself to him in the form of a rumour. “A long time ago, I heard a story which I wasn’t sure was true,” he said, “about all this gold coming to the Sun Life Building’s vaults, far below the surface at the height of the Second World War. I thought, ‘That’s curious,’ but it turned out to be a critical moment in the war: if that gold had ended up at the bottom of the ocean, England wouldn’t have had the money to buy arms from the U.S., which was operating on a cash-and-carry basis, and fight off Hitler.” Vast amounts of French and English gold were shipped to North America to avoid being claimed by the Nazis, McKenna reveals, with Montreal and Ottawa becoming important for storage. It’s but one example among millions of gold being moved, hidden, stolen, reclaimed and sunk to the bottom of the sea through the ages, making and breaking many a nation along the way. Those expecting an escapist narrative about the enduring allure of one of the world’s oldest currencies don’t know McKenna. A founding producer of The Fifth Estate, he’s like the anti-Midas: he can’t help but dig up the dirt on anything he touches. His 1992 CBC documentary The Valour and the Horror received five Gemini Awards, while sparking a CRTC investigation, a senate inquiry and a $500 million lawsuit by Air Force veterans, which was dismissed. All to say, the man is used to ruffling feathers. In keeping with tradition, The Secret World of Gold is far from a puff piece. “It’s the toughest documentary I’ve ever made,” McKenna said. “It took over a year, and led me down so many corridors. Once you go down one corridor, two doors open, and you don’t know which one to take. This happened over and over. It’s virgin territory. No one has been down this path before, to report it.” Though his film reveals amazing things about humanity’s conflicted relationship with gold, McKenna was most excited by the human story at its centre. Maguire may well have put his life on the line by speaking out, the director explained. “We weren’t able to include it in the film, because it’s still a mystery, but it looks like somebody tried to kill him. Two days after he blew the whistle (to the Gold Anti-Trust Action Committee, in 2010), out of nowhere a van rammed and almost demolished his car. And there was almost no investigation. I wish to remain anonymous as of now as fear of termination mounts from what I am about to reveal. Robert Gottlieb is not my real name; however he is a trader that is involved in a lawsuit for manipulative trading while working with JPMorgan Chase. He was acquired during our Bear Stearns acquisition and is known to be the notorious person shorting in the silver future market from his trading space, along with Blythe Masters, his IB Global boss. However, with that said, we are manipulating the silver futures market and playing a smaller (but still massively manipulative) role in manipulating the gold futures market. We have a little over a 25% (give or take a percentage) position in the short market for silver futures and by your definition this denotes a larger position than for speculative purposes or for hedging and is beyond the line of manipulation. On a side note, I do not work directly with accounts that would have been directly impacted by the MF Global fiasco but I have heard through other colleagues that we have involvement in the hiding of client assets from MF Global. This is another fraudulent effort on our part and constitutes theft. I urge you to forward that part of the investigation on to the respective authorities. There is something else that you may find strange. During month-end December, we were all told by our managers that this was going to be a dismal year in terms of earnings and that we should not expect any bonuses or pay raises. Then come mid-late January it is made known that everyone received a pay raise and/or bonus, which is interesting b/c just a few weeks ago we were told that this was not likely and expected to be paid nothing in addition to base salary. January is right around the time we started increasing our short positions quite significantly again and this most recent crash in gold and silver during Bernanke’s speech on February 29th is of notable importance, as we along with 4 other major institutions, orchestrated the violent $100 drop in Gold and subsequent drops in silver. As regulators of the free people of this country, I ask you to uphold the most important job in the world right now. That job is judge and overseer of all that is justice in the most sensitive of commodity markets. There are many middle-income people that invest in the physical assets of silver, gold, as well as mining stocks that are being financially impacted in a negative way b/c of our unscrupulous shorts in the precious metals commodity sector. If you read the COT with intent you will find that commercials (even though we have no business being in the commercial sector, which should be reserved for companies that truly produce the metal) are net short by a long shot in not only silver, but gold. It is rather surprising that what should be well known liabilities on our balance sheet have not erupted into wider scale scrutinization. I call all honest and courageous JPMorgan employees to step up and fight the cronyism and wide-scale manipulation by reporting the truth. We are only helping reality come to light therefore allowing a real valuation of our banking industry which will give investors a chance to properly adjust without being totally wiped out. I will be contacting a lawyer shortly about this matter, as I believe no other whistleblower at JPMorgan has come forward yet. Our deepest secrets lie within the hands of honest employees and can be revealed through honest regulators that are willing to take a look inside one of America’s best kept secrets. Please do not allow this to turn into another Enron. So, the FOMC accidentally released the March minutes early yesterday but did not bother to inform the markets until after 9:00 am, timed perfectly to push Gold down on the supposedly hawkish sentiments of a number of members who have no power to set policy. Gold was sold with extreme prejudice back to $1558 per ounce on the notion that quantitative easing will likely be abandoned by year end. In other news water is wet. The Fed is still at war with Gold. Silver sold off mildly to $27.60 but is still far higher than its recent lows. At some point the narrative that a rising stock market can lift only itself while everything else falls in price will break down. The S&P 500 continues to rally on pure liquidity and some strong flows into previous laggards like Microsoft and Intel. For now, momentum is the order of the day and it will continue until it doesn’t. Gold continues to uncover huge buying in the $1550-1560 band, but the chart looks very heavy and the lack of upside follow-through has even the staunchest bulls worried at this point. This was the point of this shambolic exercise. The timing of these ‘mistakes’ are designed to reward the connected and fleece everyone else. In the end nothing has changed. Europe will be saved by having the ECB roll the sovereign gold of their vassal states onto its balance sheet, the NY investment banks want all the gold for themselves and will use their position with the Fed to facilitate this transfer via the paper markets. “The gold and silver markets have become virtual markets. There is no physical aspect, essentially, to the way they trade on an intraday basis. Extremely large volumes of synthetic supply are just created and exchanged. That’s primarily through the bullion banks, which also have exposure to the physical market, and the managed money and the specs. So when you look at the COMEX, it’s not a delivery market. It’s actually no more than a casino. The price of real physical gold in the actual world markets is, by default, set at the margin because of this incredible leverage. It bears absolutely no relationship to the real, unleveraged supply/demand fundamentals. But here is what we are actually witnessing now: This dislocation is about to blow up. The Price Smash – Who, What, How and Why? There is no doubt that we are at a critical juncture in gold and silver and the first order of business is to drill down to how and why prices plunged so much Friday and Monday. Certainly, more commentary (mostly on gold) is being written about the precious metals currently in regards to the price weakness than I can remember. Unfortunately, much of the analyses and commentary is wide of the mark, in my opinion. But the great thing is that everyone interested in what just took place with gold and silver prices can decide for themselves from the multitude of opinions offered as to what makes the most sense. For me, explaining what took place is easy, since the price plunge occurred in the confines of how I analyze gold and silver. First, what exactly did happen? Basically, a neutron price bomb was detonated in certain NYMEX/COMEX markets that selectively targeted gold, silver, copper, platinum, palladium and crude oil prices. On just about every other market, like stocks, bonds, currencies, grains, meats, soft commodities yesterday was non-eventful pricewise. The importance of this distinction that only selected markets experienced unusual price weakness is that it eliminates many general knee-jerk explanations about prices being impacted by broad macroeconomic factors. How could broad economic factors influence certain commodities and not the stock or currency markets? Looking deeper, the commodities experiencing price weakness all have different supply/demand fundamentals relative to one another, so as to eliminate the possibility that all those unique fundamentals changed yesterday in synch. Commodity fundamentals change glacially; it’s impossible for the supply/demand equation of many various commodities to change overnight. So, if it wasn’t abrupt change in the fundamental story in the various separate markets that were hit to the downside yesterday, then what the heck accounted for the steep declines in price? Stated differently, what was the common denominator present in the markets that plunged? The most visible common denominator was that the various big price declines occurred on the NYMEX/COMEX markets owned and run by the CME Group. But the most important common denominator was the nature of the buyers and sellers across all the markets that got smashed. Without exception, in any market that declined significantly, the big net buyers were the traders classified as commercials and the big net sellers were those traders classified as non-commercials, largely technical trading funds. Not only was this true yesterday, it has been true on every single big price decline throughout history, according to US Government data (COT reports). This may seem elemental, but I ask you to contemplate this anew. In the highly-charged emotional state of significant price declines, it is tempting to accept fabricated stories as to what may be the cause of the declines. Because of that, it is more important than ever to rely on the known facts and only that which can be substantiated. COT data have and will show without question that the commercials are always the big buyers and the technical funds are always the big sellers and there was no exception this time. Once you know who the big buyers and sellers are (which is the beauty of the COT), only then can you proceed to the how and why of the big price declines. Armed with the certain knowledge that in every market that declined substantially the big buyers were the commercials with the big sellers as the technical funds, how and why fall into place. Why is real easy – in order to make money. The way one makes money is by buying low and selling high, although not necessarily in that order. For instance, JPMorgan the big concentrated short seller and manipulator of silver and other markets, has made a boatload of money, many hundreds of millions of dollars, by short selling at higher prices than the prices they have been buying back at. I don’t begrudge JPMorgan for making large trading profits if they were doing so legally, but that is not the case. The trading profits being made by JPMorgan and the other commercials are as far from legal as is possible. That’s the only plausible conclusion a reasonable person could reach when answering the last open question – how do they do it? Knowing who the buyers and sellers are and why, all that’s left is the how. Simply stated, JPMorgan and the commercials have captured control of the mechanism that sets short term prices, by means of High Frequency Trading (HFT), which dominates modern electronic trading. Whenever JPMorgan and the commercials wish to set prices for any market sharply higher or lower, they can and do set those prices. That is an incredibly powerful trading advantage. Since the technical funds, which are always the counter parties to JPM and the other commercials, rely on price changes to initiate their buying and selling, these funds are, effectively, controlled by JPMorgan and the commercials. Sunday night was a classic example in that JPMorgan and the commercials kept setting lower and lower prices in the NYMEX/COMEX commodities mentioned to induce more and more technical fund selling so that JPM and the commercials could and did buy. The commercials knew there was residual margin call liquidation for Monday morning, following Friday’s rout, so rather than let panicky margin call sellers out with additional losses of 50 cents in silver or $20 in gold, the commercials rig prices lower in thin Sunday night Globex dealings by $3 in silver and close to $100 in gold. This is similar to the May 1, 2011 Sunday night $6 massacre in silver. The only difference is that this time the commercials took all other important NYMEX/COMEX markets down with silver. The proof that this is how the market operates can be seen in current and historic COT data in that on big declines in price the commercials are always big buyers and technical funds are big sellers. In fact, I don’t know that there can be an alternative explanation based on actual data. Of course, there is no way a small group of large banks and financial firms could be continuously pulling this trading scam off without prearrangement and collusion. And of course, this collusion and price control is against the law and any sense of fair trade. We actually have in place a federal regulator, in the form of the CFTC and a self-regulator in the CME, specifically created to combat the trading operations I just described, who both refuse to end the ongoing scam. Clearly, the main impetus behind Monday’s price decline is margin call liquidation by those holding long futures contracts. Although I’ve always warned not to hold silver on margin, at times like this I kick myself for not having warned more forcefully. The $200 gold and $5 silver move over the past two days has resulted in most holding long gold and silver futures contracts to be forced to immediately deposit $20,000 to $25,000 for each contract held or be sold out by their brokers. These demands for such large amounts of money have resulted in an avalanche of panic selling. And it matters little if you believe, like me, that there was an intent behind the extreme price declines or if the margin call selling was spontaneous and beyond intent. In the end, there can be no question that gold and silver (and copper, platinum, palladium and oil) are down today due to extraordinary trading activity on the NYMEX/COMEX, led by margin call selling. If you accept the premise that massive margin calls are at the center of today’s price decline, the next question is when will the margin call selling end? We know from market history that such selling must burn itself out fairly quickly. This is particularly true in COMEX gold, copper and silver, since there was not a large relative speculative long position to begin with, following months of speculative net long liquidation and new short selling. I don’t think that technical funds are adding aggressively to short positions today since current prices are so far below the popular moving averages so as to make the normal stop loss points above too excessive for prudent risk taking. This looks like plain-vanilla leveraged long liquidation in which the selling pressure has reached a climax and, therefore, must soon end. Prices will stop going down when the margin call liquidation, principally on the COMEX, ends. The next question is what happens when prices stop going down and the margin call selling burns itself out. In other words, what does the next price rally look like; will we go up slowly or with a rush? No one knows for sure, but the possibility exists that prices could rocket higher. Certainly, any market that can fall 10% in a day can rise by that amount (or more) as well. But what improves the odds of a rush to the upside is the incredible degree of commercial buying that has taken place in the markets that have been smashed. We’ll have to wait until this week’s COT report, but there appears little doubt that it will indicate more record net commercial buying as has been the case for weeks and months. Since I’m convinced beyond question that the price of silver has been manipulated by the big commercials on the COMEX, watching them buy aggressively suggests they could let the price rip to the upside with the same intensity that they’ve orchestrated to the downside. With the record-setting trading volume Monday and on Friday, I would not be surprised if JPMorgan had eliminated its concentrated silver short position. I think it obscene that the CFTC and the CME have stood by and allowed JPMorgan and the other crooked commercials to disrupt the orderly functioning of the markets, but this is nothing new. The reality is that JPMorgan and their collusive partners are better positioned for a price rally in silver and other markets like never before. As painful as the severe price declines have been, at least holders of fully-paid for silver retain the option of holding without having to deposit large sums of capital or lose their position. I know that I’m holding, in addition to holding call options. This is, unfortunately, not an option for holders of leveraged metal in the form of futures contracts. While it is true that a good number of leveraged longs have been forced from the market and are unlikely to buy anytime soon, that is not a factor necessary for silver prices to climb in the future. The ultimate resolution for silver prices has always depended upon the physical market. In terms of the physical market, the severe price declines would suggest the physical resolution should be accelerated. Every free market economic principle holds that lower commodity prices increase demand and curtail supply. Clearly, the sudden price decline in silver is not causing miners to rush into increasing production. And as soon as prices stabilize (which I think is very soon), buying pressure will increase to take advantage of the sudden bargain prices. The manipulated sell off on the COMEX has led to bargain hunting and a surge in physical coin and bar buying internationally. Gold bullion inventories on the COMEX are being depleted rapidly, and certain bullion products are either out of stock or production and distribution has been suspended. The gold sell off has stoked a frenzy among coin, bar and jewelry buyers from China to India and the U.S. and Europe. JP Morgan’s eligible gold inventories fell by more than 70% this week which suggests there may be supply issues in the larger London good delivery gold bar market also. This is important to keep an eye on next week. The death of the gold market is greatly exaggerated and gold’s long term secular bull market is set to continue due to very large and increasing physical demand for bullion internationally. We know that back in early October 2010, when gold closed at a then record high of $1,320, JPM decided to reopen its previously mothballed precious metal vault due to soaring demand for metal vaulting, thus becoming only the fifth official Comex private gold depository in New York in addition to HSBC, Bank of Nova Scotia, Brinks and MTB (and of course the New York Fed). We also know, courtesy of a Zero Hedge exclusive, that the JPM vault – the largest private gold vault in the world – is located at 1 Chase Manhattan Plaza, and is literally adjacent to the vault of the New York Fed 80 feet, and 5 sublevels, below street level. We know that for a long time the vault held around 2.5 million ounces of eligible (commercial) gold, a number which declined only gradually until very recently. We know that the total amount of registered (investment) gold has been steady for the past 4 years (after peaking in early 2006). Finally, everyone knows that in the past month gold has experienced a very severe move lower which is still largely unexplained. What many may not know, is that while registered Comex gold has been flat, the amount of eligible gold in Comex warehouses (the distinction between eligible and registered gold can be found here) in the past several weeks has plunged from nearly 9 million ounces, to just 6.1 million ounces as of today- the lowest since mid-2009. What nobody knows, is why virtually the entire move in warehoused eligible gold is driven exclusively by one firm: JPMorgan, whose eligible gold has collapsed from just under 2 million ounces as of the end of 2012 to a nearly record low 402,374 ounces as of today, a drop of 20% in one day, though slightly higher compared to the recent record low hit on April 5 when JPM warehoused commercial gold touched a post-vault reopening low of just over 4 tons, or 142,700 ounces. This happened just days ahead of the biggest ever one-day gold slam down in history. What happened to the commercial gold vaulted with JPM, and what was the reason for the historic drawdown? Gold, unlike fiat, is not created out of thin air, nor can it be shred or deleted. Where did the gold leaving the JPM warehouse end up (especially since registered JPM and total Comex gold has been relatively flat over the same period)? Did any of this gold make its way across the street, and end up at the vault of the building located at 33 Liberty street? What happens if and/or when the JPM vault is empty of commercial gold, and JPM receives a delivery notice? It has been a painful few days for those who believe that gold (and silver) are a safe haven from government money-printing machines and the mountain of debt of the Western economies. In the space of two days, gold prices fell just over $200 an ounce (13%) in a frenzy of selling. Silver prices dropped over $4, or 15.6%. The bears were licking their chops. The bulls were licking their wounds. Why? There was the flippant answer: gold was in a bubble, gold is a useless barbarous relic. The investment banks came out with their bearish reports. Société Générale was one of the first, then this past week Goldman Sachs advised selling gold. Other investment banks chimed in. There was even a book – Gold Bubble: Profiting from Gold’s Impending Collapse – by Yoni Jacobs. A story emerged that Cyprus would sell its gold to help pay for its bailout. Cyprus’s gold holdings totalled 13.9 tonnes, or 447,000 troy ounces, with a current market value of about USD 600 million. That would barely make a dent in Cyprus’s bailout needs. The suggestion to sell the gold came from ECB head Mario Draghi, who said that profits from gold sales should be used to cover losses the ECB might sustain from emergency loans to Cypriot commercial banks. In an unprecedented move, depositors’ funds were also to be used to cover some of the losses as a condition of the ECB/IMF loan. This template could be used for future bank bailouts (or in this case a “bail-in”). The decision to sell the gold was to be made by the Cypriot central bank, which later denied it would do so. The Cyprus parliament has asked the Cypriot central bank to review the request to sell the gold. Irrespective, 13.9 tonnes is barely a week’s demand in China. The talk of Cyprus selling its gold prompted fears that other countries (Spain, Greece, Portugal, Italy, etc.) would be pressured to sell their gold as well. Under the Washington Agreement of 1999, the European central banks agreed to limit their sales to no more than 400 tonnes annually over a five-year period. In 2012, central banks purchased net 535 tonnes of gold much of it being Asian banks led by China. The European central banks have been consistent in stating that they do not wish to sell their gold holdings. The trigger to the deluge of selling was the sale on April 12 of at least 400 tonnes (some said 500 tonnes) of gold in the June futures contract. It started with 100 tonnes at the open followed by another 300 tonnes 30 minutes later. http://news.sharpspixley.com/article/ross-norman-gold-crushed-by-400-tonnes-or-usd20-billion-of-selling-on-comex/159239/. Four hundred tonnes is 12.86 million ounces or 128,600 gold contracts on the COMEX. It has a value of $19.3 billion (or $24 billion if it was 500 tonnes sold) at $1,500/ounce and would require initial margin of at least $760 million and possibly as much as $1 billion. Who would be able to put up that much money in order to execute such a large trade on the COMEX? The order apparently came through the Merrill Lynch trading desk. It was, as one pundit declared, “shock and awe” in the gold market. The sale was one of “naked shorts”, which means no physical gold was sold. It is highly unusual to drop that much gold on the market at one time. The CFTC is already investigating gold prices to see whether there is manipulation in London by the handful of banks who meet twice a day to set the spot price for physical gold. Following the LIBOR scandal, it probably is not unusual that they would also investigate the setting of gold prices. It wasn’t physical gold that was sold; it was paper gold. It had the desired effect as it pushed the price down through $1,525, the level that had acted as the low since December 2011 and had been viewed as a line in the sand for the gold market. That immediately triggered scores of stop sells that would have been just below $1,525. The frenzy continued into Monday as further selling came in. The huge selling towards the end of the day was most likely margin calls that would have been triggered by such a substantial drop. Dr. Paul Craig Roberts, a former US Treasury official, has written that the Federal Reserve is rigging the bullion market in order to protect the value of the US$, which is being threatened by the Fed’s quantitative easing (QE) program. The supply of dollars is growing faster than demand. A fall in the value of the US$ would raise import prices (the US is a net importer with a large trade deficit). It could raise inflation and drive up interest rates and the value of debt-related derivatives. This in turn could put pressure on the “too big to fail” banks. The US$ has been under attack. The “BRICS” countries are attempting to set up their own version of the IMF and the World Bank. They would not use the US$. China is attempting to set up a Yuan currency-trading zone in Asia. China and Russia already conduct trade in Yuan and Rubles. Other trade deals are bypassing the US$ as the means of trade. Others including Japan and Australia are joining the new currency zone as they depend heavily on trading with other Asian nations and would not want to be left out. There are potential supply problems for gold. A couple of weeks ago the Netherlands’ largest bank, ABN Amro, defaulted on contracts with its customers for delivery of gold. 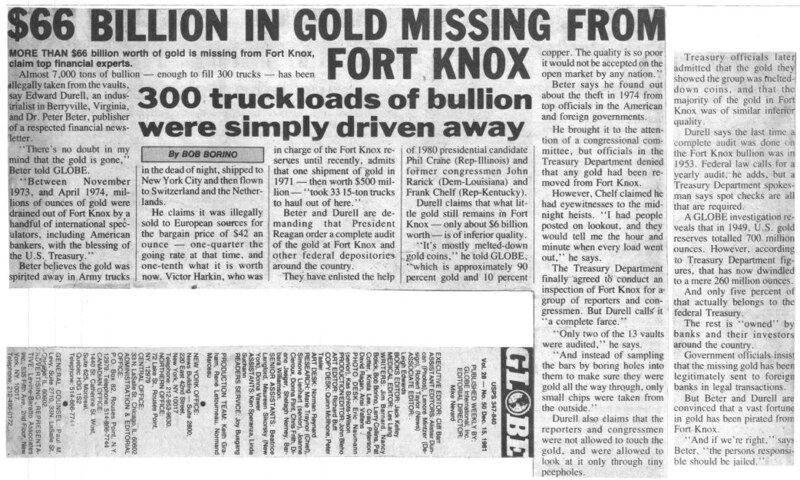 They were instead paid in Euros: http://www.examiner.com/article/largest-dutch-bank-defaults-on-physical-gold-deliveries-to-customers. ABN Amro customers thought they owned a risk-free physical asset (gold). In fact, they owned an IOU from ABN Amro. Coin dealers and others continue to report robust demand. The Perth Mint in Australia said that following the sharp drop in prices, its business doubled from the previous week. Long lines have been reported in India and China to buy physical gold, in either jewellery form or coins for investment. The US Mint has reported strong sales of gold coins following the two-day plunge. Some US states concerned about the policies of the Fed have made gold legal currency. Others are considering doing the same. http://www.bloomberg.com/news/2013-04-08/trust-in-gold-not-bernanke-as-u-s-states-promote-bullion.html. Every year gold demand has exceeded annual mine supply. The chart below compares production and demand and shows the annual deficits, up to 2011. It was a similar picture in 2012 as the trend continued. The deficit is made up with recycled gold. 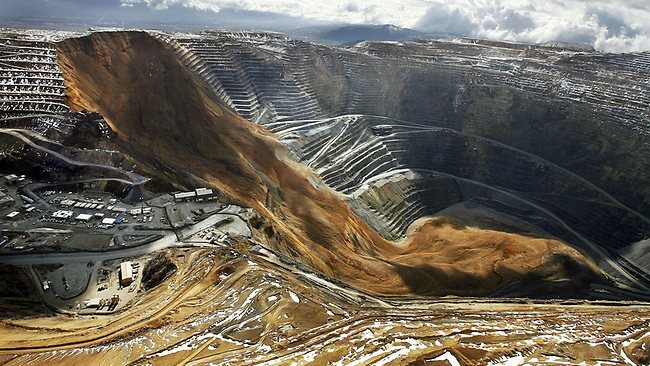 Mine supply has been growing over the past few years after falling in the early part of the millennium. Following years of falling gold prices in the 1990s. many mines had stopped production because costs exceeded what they could get for their gold. With the recent sharp drop in gold prices, could that happen again? “The rapidity of gold’s drop is impressive, concerning, and disorderly. We have seen two other such instances of disorderly ‘hurried’ selling in the last five years. In July 2008, gold quickly dropped 21% – seemingly pre-empting the Lehman debacle and the collapse of the western banking system. “I’ve been watching gold for so long that literally nothing fazes me anymore. I am sure that yesterday’s drop turned the stomachs of many a gold investor. And while I am not ashamed to admit that there were a few moment of anger watching things unfold, I can also say that my reaction was nothing compared to the horror of times past. Today we saw a mild bounce in price after even more weakness brought prices down to $1320. And even the most ardent bear would not have thought what we’ve just witnessed was possible or would note that this type of action is indicative of anything they predicted. This entry was posted in money, spectre by secret santa. Bookmark the permalink.